Discover the God-inspired difference only you can make in the world—using the key you never knew you had. Tim Tebow credits his mom with being the key to his success―but Pam never expected that she would be known on a national stage. For most of her life, she was serving quietly and faithfully as a wife and a mom―choosing life for her child in the face of medical risks, answering the Lord’s call to mission work in the Philippines, and homeschooling before anyone knew what the word meant. But all along the way, her experiences―and her consistent, everyday choices to follow the Lord and to serve wherever He placed her―were creating unexpected ripples of influence throughout her family, her community, and her world. And they would end up extending far beyond anything she ever imagined. Pam believes that every one of us can be influential―and that deep within a woman’s heart is the desire to use her influence for good. 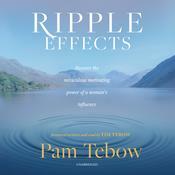 In Ripple Effects, Pam uncovers and explores the miraculous motivating power of influence we can have on this generation and the next, no matter where we are planted in life. Whether we are in the midst of endless diaper changes, climbing up the corporate ladder, or simply doing our best to live, love, and serve well each day, Pam will encourage us to maximize our God-given opportunities for influence―and watch how far the ripples will spread. 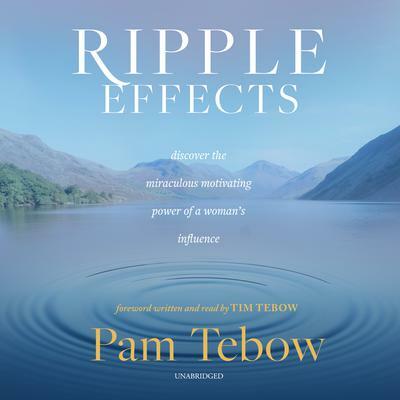 Pam Tebow travels and speaks across the country, encouraging women to use the incredible influence God has given them to eternally impact their world. Pam has appeared on Good Morning America and has won national awards for her ministry work. She graduated with honors from the College of Journalism and Communications from the University of Florida.